Raw zucchini noodles make a wonderful low-fat, low-cal and low-carb substitute for regular noodles, as well as providing vitamin C, potassium and folate. STEP 1) Cut the zucchini into long strands using a spiraliser, stopping when you reach the seeds. Alternatively, cut the zucchini into long ribbons using a vegetable peeler. Use a sharp knife to cut the kernels from the corn. 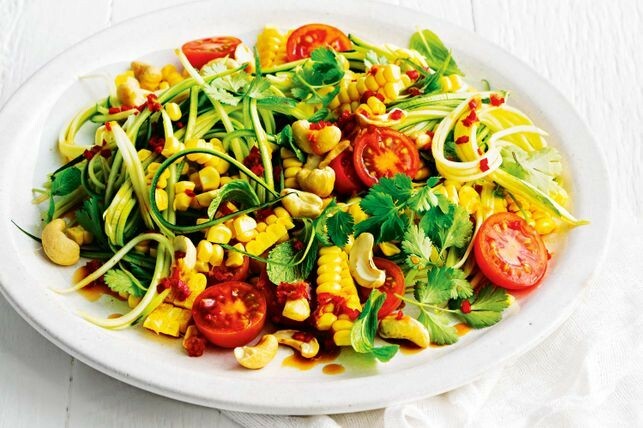 STEP 2) Combine the zucchini, corn, tomato, mint and coriander in a large bowl. Combine the chilli, lime juice, tamari, ginger and sugar in a small bowl. Stir to dissolve the sugar. STEP 3) Drizzle the dressing over the salad and toss gently to combine. Serve sprinkled with the cashews.